The game can be played by 2, 4, 6, or 8 players who are equally divided into teams. Or it can be played with 3, 6, or 9 players divided into three opposing teams. We have played with 2 and 3 players and - as the rules of the game suggest - the game is indeed more exciting with all three colors being played at once. However, we've had a good time in 2 player games as well. The game is deceptively more challenging that it initially seems. 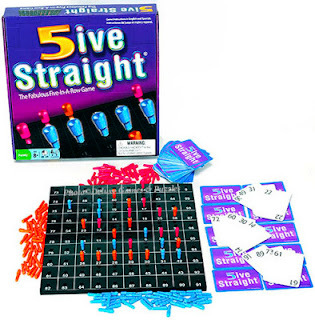 The object of the game is to be the first player or team to successfully place five pegs in a row (straight, vertical, horizontal or diagonally). The rules of the game are very simple. It is at this point that I should note that I am not a person who finds reading, comprehending and teaching rules of games to be a particularly easy task. When handed the sheet of paper which contains the rules of a game, my mind generally goes blank and my eyes cross. However, in the case of 5ive Straight it was easy to comprehend and teach my children to play with me. - The dealer shuffles and deals 4 cards to each player, face down. The remainder of the deck remains face down near the game board. - Players can look at their own cards but should not show them to any of the other players. 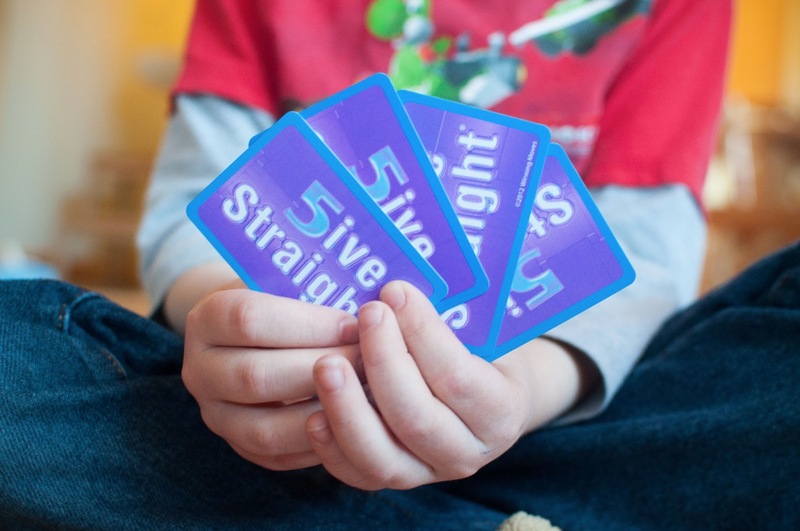 - A turn consists of either playing a card and placing a peg or of drawing a new card to add to your hand. You can only have 4 cards in hand. - A card can becoming a "dead" card by being played out on the board. For example, if you are holding card "92" in your hand and all spots on the board from 92-99 have already been filled, then "92" is dead. You cannot dispose of it. You do not want four dead cards in your hand or you will automatically lose the game. This game does involve a little strategy. Lower cards are the more valuable as they allow you to play in the most places. Whether you decide to play a peg or draw a card affects the outcome of the game. Ultimately we've had a surprising lot of fun with 5ive Straight - I've even enjoyed playing it! - and we highly recommend it! Thanks to Winning Moves Games, Inc. for sending a copy of this game to our family to check out in exchange for our honest opinion. We honestly recommend it!